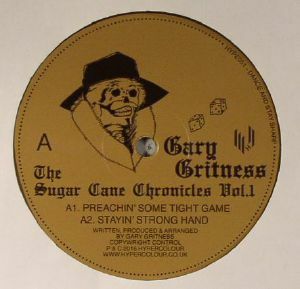 Gary GRITNESS The Sugar Cane Chronicles Vol 1 vinyl at Juno Records. Hypercolour continue their impressive blossoming into one of the UK's most adventurous labels with this killer electro document from Mr Gary Gritness. Patrons of the church of Clone will be familiar with Gritness, with the French producer landing a deadly pair of Adventures 12"s on the Dutch label's Clone Crown Ltd last year. We've been hankering for some fresh Gritness since then so shout outs to the Hypercolour crew! If you aren't familiar with Monsieur Gritness, The Sugar Cane Chronicles Vol 1 makes for a fine introduction, deploying four productions of rugged drums, blissful synth riffs and dreamy melodies. Our pick of the bunch? It's gotta be the lead track "Preachin' Some Tight Game".